My love for horses started at a very young age and I proudly owned every single My Little Pony and Grand Champion figurines I could get my hands on. I could even recite the Grand Champion song that was played on their commercial in my sleep. At the Kingwood Equestrian Center, at age 7, the barn owner and instructor very reluctantly allowed me to start taking hunter/jumper lessons. She normally didn’t allow students to start taking lessons until age 8 but my mom assured her that I was very strong willed and if after the first lesson she felt I still wasn’t ready then I would wait another year. 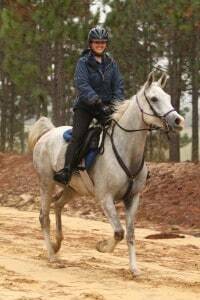 Fortunately, the owner quickly understood my mom’s plea and I was enrolled in weekly riding lessons for the next 3 years. In 1998, I got my first taste of endurance. After taking endurance lessons for two months, my mentor decided I was ready for my first Limited Distance (25 mile) competition. On the way to the venue, my mentor decided I was ready for the 100 mile competition instead. My dad quickly second guessed the idea, and we all settled on the 50 mile distance. I have been hooked on endurance ever since. To date, I have accumulated just under 4000 competition miles on 33 different horses with 55 top ten completions and 11 wins. The thrill of crossing the finish line after riding a 100 mile competition, and having just spent the past 10+ hours in the saddle is like no other feeling in the world. This year has already started off with a bang. My horse, WHR Sleak Streak, completed her first CEI** in South Carolina in 3rd place, and five weeks later my horse, FYF Shabaani, placed 5th in the Team Selection Trials at a CEI*** in Florida. I was also named the 2016 Central Zone’s Chef d’Equipe for the North American Junior and Young Rider Championship taking place in July in Parker, CO. Before that, I will be traveling to Puerto Vallarta, Mexico to marry my love on the beach with our family and friends present.